Bailiffscourt Hotel & Spa’s popular Carols by Candlelight series returns this December. 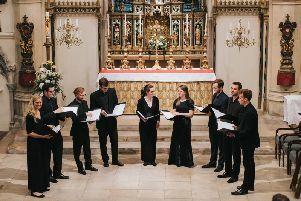 The three performance dates are Sunday, Monday and Tuesday, December 16-18, and the concerts take place in the enchanting surrounds of the West Sussex venue’s 13th century chapel. This is set within 30 acres of private parkland and the intimate location will be lit up by hundreds of candles. The performers will be The Agnes Collective who have sung in some of Britain’s top music venues including the Royal Albert Hall, The Royal Opera House and Glyndebourne. Guests are invited to create their own family festive tradition and choose from the three performance dates with a fine festive lunch or an indulgent afternoon tea. Alternatively, visitors can make an evening of it with a delicious dinner. Lunch seating costs £67. Visitors arrive at 12.30pm for a two-course lunch with a glass of wine, followed by coffee and festive nibbles in the chapel at 1.30pm with the carol performance at 2pm. Afternoon tea seating costs £47. Festive afternoon tea starts at 3.30pm followed by mulled wine in the chapel at 4.30pm and the carol performance at 5pm. Evening seating costs £87. Arrive at 7pm for sparkling drinks in the chapel followed by the carol performance at 7.30pm and a three-course festive dinner with a glass of wine at 8.30pm. To book your place visit hshotels.co.uk/Bailiffscourt or call 01903 723511. Bailiffscourt Hotel & Spa is in Climping Street, Climping, West Sussex.